Gwendolyn “Elaine” Emeline Brown Manley, 68, of Charles City passed away Wednesday, April 3, 2019. Elaine was the last born of six children on November 6, 1950 to the late Leo A. Brown and Irene Anderson Brown. She grew up in Seven Pines, Sandston, Virginia and developed into a sister, aunt, friend, wife, mother, and grandmother. In Elaine’s early years she attended Eastern Henrico County Schools, Fair Oaks Elementary and Virginia Randolph High School. She was a member of the band, where she played the flute and the clarinet. 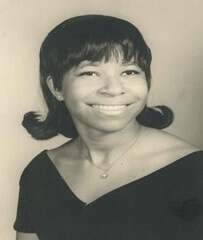 Following her graduation from Virginia Randolph, Class of 1969, Elaine went on to attend, Pan American Business School, in Richmond, Virginia. She was employed for several years as an Assistant Manager and Manager for Southland Corporation. In 1980, she went to work for Dupont Fibers where she retired on disability. Elaine accepted Christ and was baptized at an early age, joining Rising Mount Zion Baptist Church. In 1970 she married the father of her children, David N. Manley and from this union came two children, Keisha and Kenneth. Elaine was magnetic. She was fun to be around and cherished the beauty of life. Some of the names she answered to were, “Momma”, “Big Momma”, “Elaine”, “Gwen”, and “Aunt Elaine”. She had a great love for her pit bulls, House, Basheba and Connie. She is preceded in death by her parents, Leo and Irene Brown; sisters Estelle “Red” C. Nash, Irene “Cookie” C. Beale; and brother, William “Billy” A. Brown. She leaves to cherish her memories, daughter Keisha N. Manley and husband Mitchell Hanley; son Kenneth “Chaney” S. Manley; grandsons, Nicholas “Nick” Hanley and Anderson “Andy” Hanley; brothers Leo E. Brown, Jr., Herman W. Brown, Sr. and wife Barbara; sister-in law Keita G. Brown; several nieces, nephews, great and great-great nieces and nephews; devoted friends, David Manley, William Barnes, Marvin Dailey, and a host of family and friends. A memorial service will be held at 11 a.m. on Friday, April 12 at Rising Mt. Zion Baptist Church, 3857 Rising Mt. Zion Rd., Sandston, VA 23150. R.I.P. SiS love you Leo Jr.
Elaine, you will be missed greatly by your friends. I will miss our lunch talks. I’m remembering all the good times we shared while growing up, and after becoming adults. I enjoyed working with you, and shopping together. I remember once we went on a double date. You were there for me times when no one else was, I could talk to you about anything. Aunt Elaine you are gone, but you will never be forgotten. Kiesha we are deeply sad for the loss of your beautiful mother. Remember that earth has no hurt that heaven cannot heal. Your mother has found the peace that only a loving savior can offer. She is in God’s care now. Will always remember her smile. Love and prayers to family. R.I.P. Auntie….I’m glad I was able to tell you I loved you when we last spoke two weeks ago. Prayers for Keisha, Chaney and the family. I’ll never forget your encouraging and loving words. Rest well Auntie….I love you. My brother and sister from another mother iam sooo sorry for y’all loss;iam going to miss hearing her voice when i call to check on her;love y’all god bless. Ma, when Chaney told me the news ; that The LORD called His Angel /u home. I felt like a knife was shoved through my ❤. I will miss You; I cherished the talks we shared, The moment we spent together and The bond, you and I had as well as the 💘 you showed my sons. I miss You, and I/we will never-forget You. Love Queen. R.I.P Ma, Sending Prayers for your love ones Chaney, Kiesha, Your Grand Kids and Mr.Manley. Believe me You Were A 🏆 through it all. Your Kind Heart will be Missed by Soooooo Manyyyyy! TRUST THAT MA!!!. I LOVE YOU MA……. This is not good bye this is a see you later auntie you will be greatly missed..we love you..
May God’s blessings, mercy and grace continue to prevail in the lives of your love ones. May you find peace and tranquility in the loving arms of God. Your beautiful smile will always be remembered.